THE STORY - In the late 1980s, amateur British sailor Tracy Edwards decided she’d had enough of being dismissed and belittled as the only woman on the seafaring crews she’d participated in. Setting her sights on the upcoming Whitbread Round the World Race—a staggering 40,000-nautical-mile circumnavigation of the earth that few boats dared tackle—Tracy assembled the world’s first international all-female sailing crew and entered the competition. As they weathered not only life-threatening high seas but also a storm of sexism in the media, this inspiring group of women had to rely on their own pure resilience—and each other—to prove the naysayers and skeptics wrong. What they hadn’t quite expected, however, was how their expedition would come to signify so much more than just a race to the finish line. THE GOOD - Rousing, inspirational and very moving, "Maiden" provides a thrilling look at a group of women who made history. THE BAD - The male interview subjects are used for nothing more than to be punch-lines, offering no other context to the story. The film plays around with its life and death stakes a little too much considering we know the ladies survive. ​​​​“The ocean is always trying to kill you. It doesn’t take a break.” With these few simple words, “Maiden” immediately sets up its stakes and plunges its audience into the world of the Whitbread Round the World Race, a 40,000-nautical-mile circumnavigation of the earth by boat that has its degree of luck, skill, and danger attached. 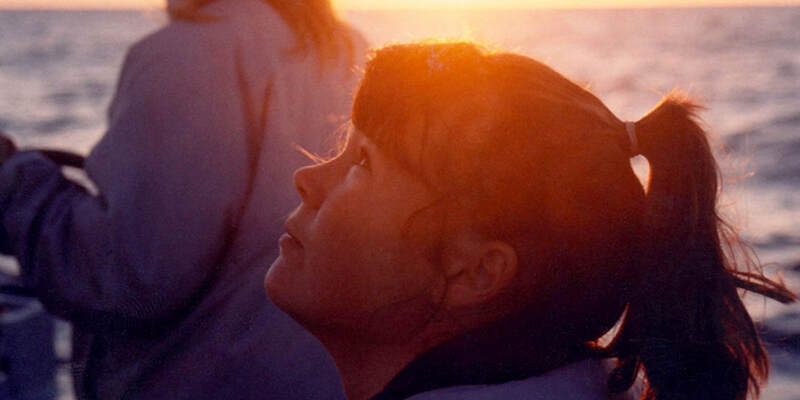 The documentary’s focus is British sailor Tracy Edwards, who in the 1980s put together the first ever all-female international crew for the race. Facing heavy scrutiny from the men in the race, the media and the world itself, these women were determined to prove the naysayers wrong and win the race. What they achieved was something far more than that and “Maiden” simultaneously achieves that same greatness with an excellent documentary worthy of such an inspiring story. Told by the sailors themselves, and with extensive footage which documented the 2-year long prep before the race and the thrilling footage that was captured during it, “Maiden” paints a fully complete picture of the kind of story it wants to tell. Starting off as a character study of Tracy itself, it soon moves past her younger years discussing her relationship with her mother and father and initial love for sailing and then moves to the formation of her crew under her leadership. As a result, it manages to strike an emotional chord with its audience as much as any narrative feature due to how extensive it is in analyzing its subject on a personal level, while never losing focus of the macro examination of what this race meant for all women, not just those who too wanted to sail. Nothing is left up to the imagination here as we set out to sea on the over 160-day long race with the women, through calm and peaceful waters, to icy chilling and violent ones as well. The footage is simply remarkable when one considers the dangers involved, where one misstep could result in falling overboard and near certain hypothermia. But history was being made by Tracy and her crew, and this gift of a documentary by writer/director Alex Holmes makes sure that we understand both the personal and social impact of their courage, skill and endurance. From a technical standpoint, “Maiden” flows effortlessly with editing that keeps the narrative moving along, jumping back and forth from the archival footage to interviews with the Maiden crew, to the male journalists and participants in the race who sneered at them, never once imagining that they would be able to compete at their level. Those defying moments, add humor to the story while the struggles of the female crew are highlighted throughout both externally and internally by each one of the crew members. Considering the amount of ground the documentary needs to cover, it’s a delight to see that it’s able to tell its story so well, with such a brief runtime, while maintaining its vision and striking a delicate balance between being informative, thrilling, emotional and exciting. Hearing Tracy herself, reflect back on her moments of triumph and her moments of failure offers a compassionate look at her humility and allows us to identify with her more as we march towards the nail-biting conclusion to the story. Will they win the race? Will they not? We know they survive because they’re obviously telling the story to us years later for the purposes of this movie, but did they actually win? In a stroke of genius that reminded me of 2017’s “Dunkirk,” Holmes’ film ends on a rousing and emotional moment of triumph (aided by an uplifting score by Samuel Sim & Rob Manning) that isn’t so much about winning and losing but what the act of defiance and survival meant to the world around those who experienced it. It will easily set “Maiden” apart from other documentaries this year and will hopefully ensure that this one becomes the gigantic hit it deserves to be.